Dinner parties can be stressful, but they don’t have to be. If you plan, prep in advance and create a fun menu you and your guests will enjoy! As a child, I loved watching my mom and grandma throw dinner parties. They both made it seem effortless and their guests always enjoyed themselves. I loved helping both ladies shop and prep because I could see the love they put into hosting parties. When I got my first apartment I couldn’t wait to host people for dinner. Over time I’ve developed a few tricks that keep me calm and able to enjoy my parties. 1. Make a plan. Every good dinner party starts with a dinner plan for me. I grab a blank piece of paper and use the top left corner to list my guests. 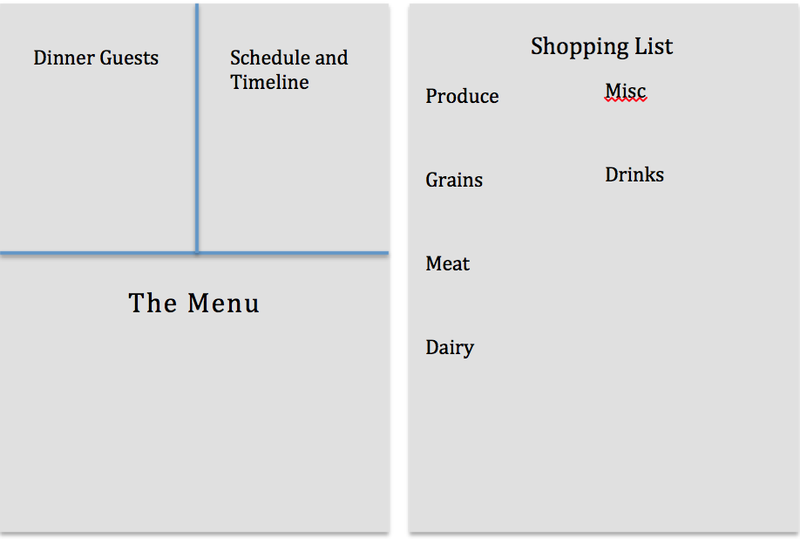 Top right corner is my timeline and schedule for shopping, food prep and cooking. Bottom half I list my menu. On the backside I make a shopping list, organized by sections of the store. I always check my pantry to make sure I’m not buying anything I already have – especially spices – so easy to forget what you have. Then on the day of the party I clip this plan on my fridge and get cooking. I pull up recipes on my iPad from Pinterest or print them out and pull out all the ingredients I’ll need. 2. Don’t be too adventurous. Waiting to try out all new recipes when you have people over can be overwhelming. Pick a new appetizer perhaps but stick to an entree you’ve done before and feel confident making. Make sure you know your dinner guests dietary restrictions are and watch spice levels. Don’t be afraid to help your guests venture out of their comfort zone, just make sure its still in yours! 3. Take short cuts. Use the expertise of your local markets to give you a helping hand for your next party. Sliced meats, cheeses and dips make an easy appetizer platter. Most stores have fabulous bread options that will compliment whatever you are making. I like to take some help on dessert too. Pre-made sponge cakes with fresh fruit and homemade whipped cream are a simple and easy dessert to serve. Don’t be afraid to grab cupcakes or a pie from a local bakery – you’ll be supporting a local business and saving yourself time. Store bought sauces can also save time, just customize them to your liking. A nice jar of pesto can be spruced up with some fresh basil, garlic and olive oil. Add veggies and some fresh herbs to a your favorite store bought spaghetti sauce. Your guests won’t even know the difference! 4. Cook and prep ahead of time. For me the best dinner party is cooked in advance. I love when I have everything prepped, cooked and warming when people arrive. It gives me time to enjoy my guests, have a glass of wine and savor the meal we share. Look through your menu and determine if any dishes could be prepped and cooked or partially cooked a day in advance or the morning of. Try to avoid having to cook while you have people over and you’ll instantly find the stress of a party fading away. Once you’ve seated your guests you can return to the kitchen to plate the meals allowing you to give it that finishing touch you’ll be proud of. Cooking in advance also allows time to do dishes in advance so your kitchen will be clean of pots and pans in the sink. 5. Do dishes after people leave. When the meal is finished, start a pot of coffee or offer after dinner drinks (my choice is always bourbon). If your guests insist on bringing dishes to the kitchen have a spot designated where they can place them and leave them alone. Once everyone has left put on some fun music and knock those dishes out! Dinner parties should be fun, exciting and most of all stress free. What other tips have kept your parties under control?